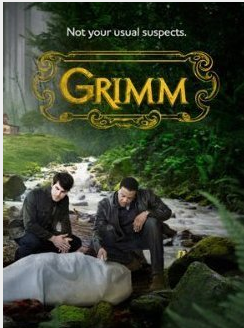 Have you been watching the new NBC series, Grimm? Two episodes in and I have to say, I’m hooked. The show is centered around Nick Burckhardt, a Portland homicide detective and descendant of the Brothers Grimm. Turns out those fairy tales have more truth to them than anyone thought. Nick inherits the responsibility of his ancestors – to protect people from the sinister creatures we all thought were make believe. Grimm has just the right amount of spook to keep you on your toes without grossing you out. I love the use of rich colours in the cinematography. It all helps to set the tone, saturating each scene with that spook factor. The show hasn’t really delved into the back story of any the characters yet, but it’s only two episodes in. I can only assume the creators are trying to establish the main storyline before sharing more with us on what makes these characters tick. All I really want is for Nick to spend a little more time in Aunt Marie’s trailer. I mean seriously, the weapons in there are enough to put a Vampire Slayer to shame, and that’s saying something. I’ve been looking for quite some time to find a TV show to fill the Whedon void in my life. Grimm has a similar tone to Buffy the Vampire Slayer and Angel – that mix of dark and sinister with moments of funny and self-mockery. Here’s a preview from the first episode. Interestingly, in the pilot the song playing while the college student runs is “Sweet Dreams” by The Eurythmics, whereas in this YouTube preview the song is completely different. I think the intro was a lot stronger with “Sweet Dreams”. Have you been watching Grimm? If not, does the preview pique your interest? I like this new show. It’s a refreshing take on the whole werewolves, creatures of the night theme. What would really blow my pants off is if they did a musical episode, like in Buffy. But that didn’t happen until Buffy’s sixth season. Sigh. I need to ask…where are the women? So far, none of the main characters are female. Aside from Aunt Marie – and without giving too much away – Aunt Marie isn’t doing too well. Nick does have a fiancee but she’s barely in any scenes. There is one other woman who’s character I’m hoping gets more screen time. We’ll see.